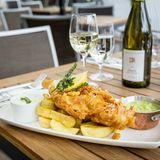 "Located at Fishermans Wharf overlooking the water, Davy’s offers a contemporary touch of Victorian London. Two bars, three different eating areas and a tasting room are perfect for private events and parties and outside there’s plenty of heated seating. 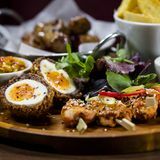 We serve a delicious dining mix of traditional British favourites and seasonal dishes using the freshest of ingredients, and there’s a grazing menu with smaller plates, sharing boards and sandwiches. 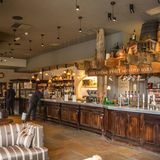 Drinks include an impressive list from Davy’s wine merchants, premium spirits and craft beers." What did you think of Davy's at Canary Wharf? I had a smashing meal with my family at the Davys at Canary Wharf the other week. The wine was of a great quality and the food was exceptional. Davys at Canary Wharf gets my vote. This is probably the best Davys I've been to. It is old style with lots of loud blokes. They do a great roast. Davys is a great pub. A traditional wine bar popular with Canary Wharf workers. Davy’s Wine Bar is one of many in a popular chain of bars scattered around London. Aimed at offering a drinking establishment a cut above your traditional pub, Davy’s has a reputation for attracting the city slickers. This branch in busy Canary Wharf is no different. Situated among many other bars on the West India Quay development, the bar populates a north-facing spot overlooking the water. It has a vast outside seating area, usually filled with smokers or people enjoying the sun (if it’s out!). Once inside, it’s got a quirky and attractive décor. Antique Champagne bottles adorn the windows and the bar is decked out with empty beer kegs. It’s a massive place with plenty of options to sit down at tables or stand propped up against the bar. At the back is a separate room, The Tasting Room, which can be hired out for private parties. The bar also has regular quiz nights, wine tasting events and various midweek offers worth checking out. The Davy’s brand is something of an institution in London and has a loyal following of drinkers. The vibe at the Canary Wharf branch feels quite formal and stiff. Staff strut around dressed in crisp white shirts and table service is offered to those sitting outside on the terrace – an old school way of drinking in itself, and not one that people wanting a cheap night out will long to pay for. The busiest times are understandably Thursday and Friday evenings, when there’s even more shirts and ties in the form of local office workers. It can get quite loud as the evening goes on, with people guffawing over pints and chatting happily. Although Davy’s caters for the masses, it seems to lack the vibe of the surrounding bars – it almost feels like people have been coming here for years and there’s nothing going on to attract new clientele, but it is always busy during peak hours, so they must be sticking to a tried and tested formula. Davy’s is open until 11pm during the week, but not open at weekends. 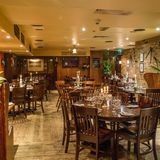 Davy’s offers quite a generalised menu with different dining options – for the table, sandwiches or full meals. Snack options include Welsh rarebit on brioche toast (£5.95) or a selection of sandwiches ranging from £6.95 to £10.95. For those wanting a proper meal, a satisfactory menu is on offer with mains including the beef steak burger with a choice of cheese, bacon or fried egg, served with hand cooked chips and costing £13.95. For those indulging in a spot of red wine, a tasty-looking cheese board is the perfect accompaniment. A selection of three cheeses served with homemade chutney, oat biscuits and bread costs £6.95. Davy’s does not include wine bar in its title for nothing. The wine selection here really is its forte, and for those who are fans of the lovely grape, there’s a heavenly selection of very decent wines to choose from. The menu is extremely detailed with lots of helpful information on which wines suit the palate. A bottle of the Gran Reserva Rioja Miguel Marino is full bodied and rich, and costs £56 a bottle. A cheaper option could be the Chilean Merlot, a lighter option on the tastebuds and the wallet, with a glass costing £4.65 and a bottle £17.50, respectively. For the ale drinkers, there’s also a good selection of beers costing from £3.75 to £4.15. These can include Shepherd Neame’s Master Brew, Sambrook’s Junction and the specially brewed on-site Davy’s Old Wallop. If you’re a fan of the Davy’s chain, you’ll love this popular bar in a prime spot on the wharf. Otherwise, it may be worth a visit for its great wine selection alone.